When anyone has new windows or doors installed in their home, security is always at the forefront of their mind. 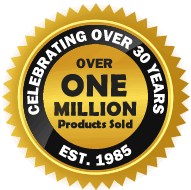 That is why all of our doors have been designed and manufactured with security in mind. Not only giving people what they want, but what they need; excellent security without compromise. With our doors you can have piece of mind and rest assure that your home is safe and secure. Traffic doors allow for outside access and as a result need to be highly secure. Our Continental Folding Doors are fitted with high security multi-point locking to traffic doors, as standard. The locking mechanism has a total of four locking points. Two deep throw hook locks, which lock onto the outerframe. This way even if the intermediate shoot bolts are not engaged the doors cannot be pulled away from the frame. A standard latch, which will hold the door closed even when not locked and a dead bolt to secure the door in the centre. Double traffic doors have a master and a slave door. The master door have the locking described above and locks onto keeps situated on the slave door. While the slave door have additional shootbolt locking top and bottom, which are operated by finger latches. The weakest point of a locking system is more often than not the locking cylinder. 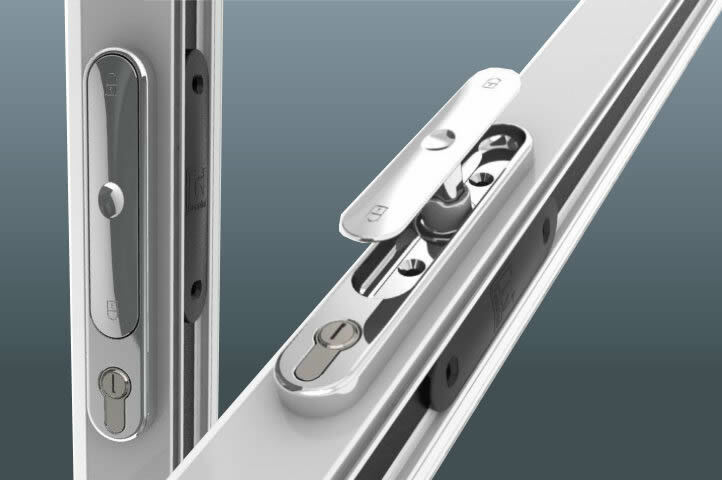 The locking cylinder that we use on these doors are not standard euro cylinders. They are pick resistant, bump resistant, drill resistant and include a sacrificial break slot to help the cylinder remain more secure in the event of being snapped. Despite the fact that the T-handles are to the inside only, all of these handles have a key locking facility as standard. This is just so you can simply lock the handle on the inside, as you would your windows, for added peace of mind. 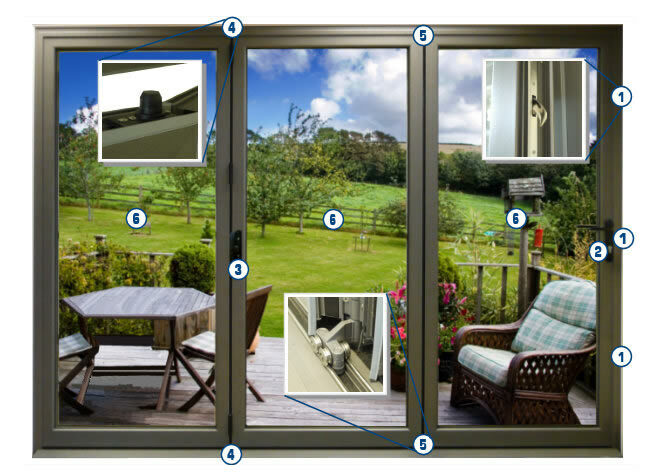 This is especially useful on bifold door styles without a traffic door, or outside access. The key on all T-handle cylinders can be keyed-a-like so that you only need one key to operate every T-handle, on each of your doors. However since the cylinder on traffic doors is an snap-secure cylinder you will always have a separate key for the traffic doors. Despite the fact that the T-handles are to the inside only, all of these handles have a key locking facility as standard. This is just so you can simply lock the handle on the inside, as you would your windows, for added peace of mind. This is especially useful on bifold door styles without a traffic door, or outside access. The key on all T-handle cylinders can be keyed-a-like so that you only need one key to operate every T-handle, on each of your doors. However since the cylinder on traffic doors is an snap-secure cylinder you will always have a separate key for the traffic doors. The bogey wheel assemblies have a dedicated guide that runs inside the channel of the outerframe, at the top and bottom of the doors. This guide not only gives the doors additional strength and stability, but also provide anti-jemmy security, preventing the folding panels from being forced or levered off of the track. This guide has been cleverly designed to protect you against forced entry and help to keep the doors stable and running smoothly. The glass for our Folding Sliding Doors is toughened safety glass as standard. The sealed units are then internally glazed with a high security glazing bead for added security and ease of installation. Because the sealed units are installed internally they can only be removed from inside the property. You can upgrade to 6mm laminated glass for further strength and security (at an additional cost).